Germany had the superior organisational skills, the more coherent plan of action and the track record but by taking the safe option, UEFA could be accused of displaying a lack of boldness as once again they ignored the claims of one the most passionate footballing nations in Europe never to have staged their flagship competition. Four times Turkey have now bid and four times they have ended up losers. They say they will now call it a day for the foreseeable future. Few would blame them after this underwhelming result. Eight years ago they were devastated to lose by a single vote for 2014, courtesy of then UEFA president Michel Platini, but this was different. This time they thought they had learned from past defeats, had enhanced their credentials and that the UEFA hierarchy would at last reward them. Yet somehow they contrived to be heavily beaten, just as Morocco were for the right to stage the World Cup in 2026. Of course, given the fact that for the first time ever UEFA had inserted important conditions about human rights in their bidding rules, voting members couldn’t just sit back and ignore the report of their evaluation committee which pointed out that Turkey’s lack of an action plan was “a matter of concern.” In addition to that, Turkey’s currency crisis has seen the lira lose almost half its value against UEFA’s working currency, the euro, in the past year. Yet the margin of Turkey’s defeat – 12-4 with one abstention – hardly sent out the most optimistic of messages to any countries other than the usual suspects to have a crack in the future. Alexey Sorokin, the public face of the World Cup in Russia who is a European FIFA Council member and was present at the vote even if he didn’t take part, took a rather different view to Gill. Which perhaps sums up the most disappointing aspect of Thursday’s result: not that Turkey lost per se but that such a huge majority went for the tried and trusted option rather than risk a ground-breaking decision. Plus the fact – and I never thought I’d say this – that UEFA have been left behind by FIFA when it comes to voting strategy. While FIFA now adopts an open vote among its entire membership, UEFA continues to hide behind the vagaries of a secret ballot. We may never know, for instance, which one of the 17 UEFA exco members abstained. Was it Ceferin, perhaps afraid to take one side or the other? Was it Italy’s Andrea Agnelli, who has personal and professional links to Turkey but may not have wanted to rock the boat among UEFA’s western European exco members or upset his predecessor as head of the European Clubs Association, Germany’s Karl-Heinz Rummenigge? It’s time UEFA copied FIFA’s approach and became more progressive in order to show who voted for whom and, just as importantly, which promises might have been broken. Fine to stick with the executive committee but open up the vote next time round, in other words for 2028. Turkey, in all likelihood, won’t be part of that next campaign. They will be licking their wounds for some time to come. But for all their pain, when all is said done perhaps they have only themselves to blame. 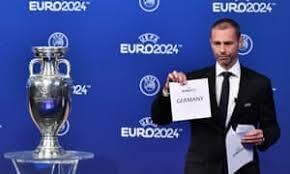 They were offered the chance, before it went to England, to hold the latter stages of Euro 2020 but decided against having a piece of the cake in order to concentrate on Euro 24 in its entirety and stick to their message of representing a bridge between two continents, Asia and Europe. In hindsight, it now seems like a calculated gamble that went horribly wrong, compounded by a sense of sour grapes when not a single Turkish official remained to speak to the media after the vote. By contrast, Germany can now shake off months of turmoil on and off the pitch as they seek to repeat the feel-good factor of the 2006 World Cup, arguably the most successful and enjoyable ever more than a decade after reunification with East Germany.